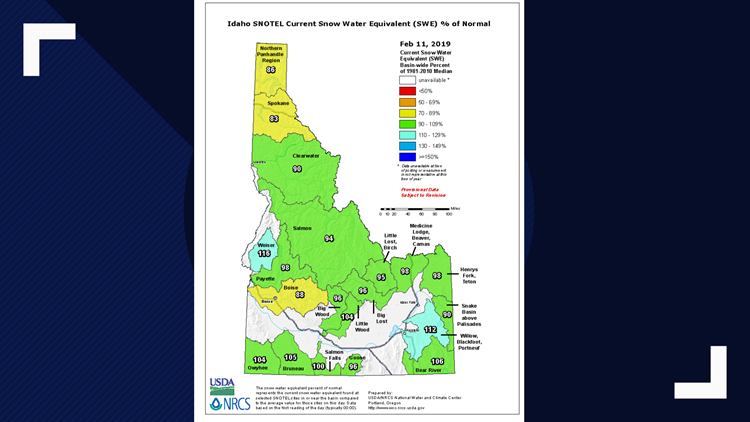 BOISE, Idaho — The recent snowfall is a good thing for water supply levels across the Gem State. Local hydrologists said the snowfall brought some much-needed snowpack and moisture to basins across much of the state. The National Resources Conservation Service takes new measurements of snowpack levels every month. As of Feb. 11, the numbers show all but three basins across the state are at 90 percent of the norm or higher. “We’ve seen two kinds of spectacular snow events since the first of the month,” said Daniel Tappa, a hydrologist with the Idaho Snow Survey. He said conditions are about where they should be, but they weren’t until recently. Before all the recent precipitation, hydrologists say moisture levels were potentially a concern so this recent snow was much needed. Even though there’s still a lot of winter left to go, Hoekema and Tappa agree that the outlook so far looks like it will be a strong water season for irrigators. The Boise Basin was one of the basins on the NRCS report that was below 90 percent, hitting just under it. Hoekema said that’s normal also because lower elevation basins like Boise Basin take longer in the year to accumulate normal levels. He said the general rule they try to go by is that by April 1, all basins should be at, or above, average snow water levels. Hoekema said something else to keep in mind with snowpack, is how fast it melts. Typically, it would start to melt around June or maybe even July. But he said if it were to melt sooner in the year, it would cause some irrigator’s water rights to be curtailed, which would mean they end up using more water storage that year. Tappa also added that the snowfall so far this winter in the mountains has been tremendous and that it’s been a very low-density powder.